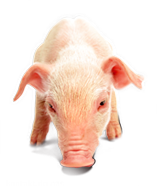 Our company is dedicated to providing the Danish pigs directly to the customer. We transport animals in the place indicated by you, and thanks to modern fleet of cars we always deliver on time. In order to guarantee low prices piglets deliver animals directly from Danish farms. We also make sure that our pets have an adequate transportation. Our clients include not only the recipient of Polish, but also from the Czech Republic, Croatia and other European countries. During the transaction we care about the high quality of our services and we are constantly in touch with the customer, informing him up to date on the status of transportation. As evidence of our profesjalizmu this is the fact that our piglets to trickle down to Georgia, the journey lasted until 7 days and all the piglets arrived in great condition. Price piglets, depending on the size of the order.